Twice each day from April 1 through October 31, the Parade of Breeds offers guests of the Kentucky Horse Park an opportunity to learn about and get close to many breeds of horses. One of the most popular of the park’s tourist attractions, this live event captures the sound and excitement of the show ring. At each show, different breeds of horses demonstrate the special skills for which the breed is known – from jumping to reining to pulling carriages. At least one daily parade includes riders wearing the authentic costumes of the countries or regions from which the breeds originate. After each show, the audience is invited to come up and touch the horses, take photos, and ask questions of the park staff members about the breeds. The Parade of Breeds show is an educational event, designed to teach the general public about the proper care of horses, the different equestrian disciplines for which horses are used, and the many strengths and differences of the various breeds. 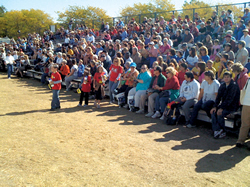 The AMHA and AMHECT regularly contribute to the costumes and supplies needed for the Parade of Breeds. AMHA is delighted to have LCS Silent Salute (aka “Sneaky”) represent the Morgan in the KHP Parade of Breeds.